This was supposed to be what one could call a Vanity project! Maybe best to avoid them, methinks. I believe the first time I saw an Alban Miniatures were the free Sharpe and Harper figures that I received when I purchased Sharp Practice from TFL some years ago. I was immediately attracted to their anatomic proportions, no awful big heads or hands. I put them away and about a year ago I decided to paint them.......they looked pretty cool, let us get some more. But Alban Miniatures went out of business a couple of years ago. I advertised around and found a nice Dutch chap who had some which he was willing to let go. I finally had some British Rifles and some French Légére Voltiguers. There are British lights and French Ligne out there also but not yet been able to lay my hands on these figures. 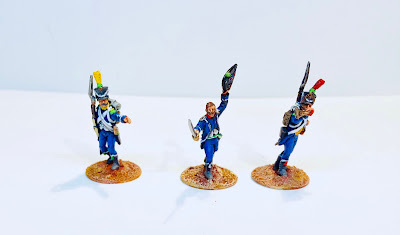 But why did I want to do this, I have plenty of British and French 28mm skirmish figures for Sharpe Practice 2, but they were of the big headed variety and this is where the Vanity comes in. I wanted a SP2 Alban Miniatures force, and since they are quite different than any other 28 mm figures, I would need at least 2 sides to play a game. 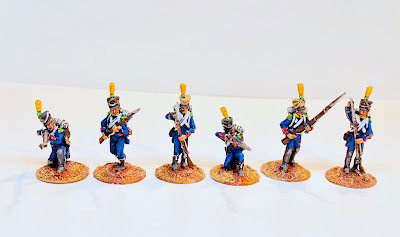 I do not have a large lead pile, so searching around for something next to paint, I decided to have a go at painting some Alban French Voltiguers. They looked well cast, minimal cleanup required so they were primed and I started to have a go. Well, I found that for a middle of the road painter like myself they were quite a challenge. I am sure each figure was about 2-3 hours of painting time. There was just much less sculpting detail to work with than I am accustomed. 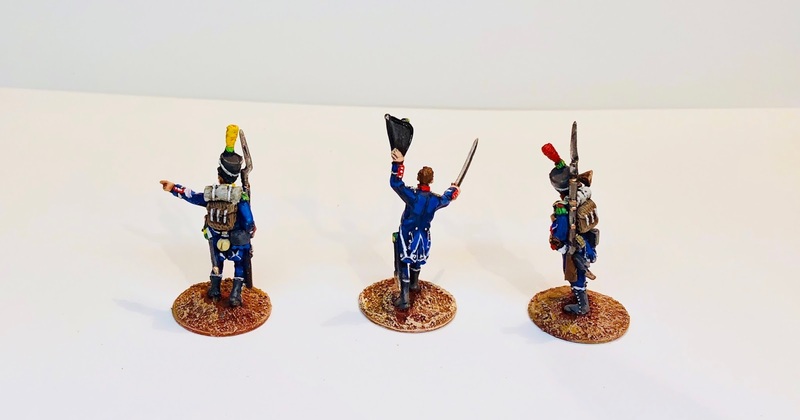 My usual painting time for a Napoleonic 28 mm figures is probably around 45 minutes. I suppose it would be OK but I am just not that pleased with the result. Well here they are, they do look good at a distance, so I suppose I will soldier on. I need at least 5-6 groups to have a good SP2 game, so a long way to go. By the way if anyone has any Alban Miniatures to sell, please let me know! Beautiful job, and great diversity of the poses John!